my stretch pants and leg warmers in the early 90s. So when I covered all the gray this last time, I opted for some random highlights and when the girl was done, I had a crown of flaming orange hair. I thought I could live with it, but I could not so I called my cousin who agreed to fix it two weeks later and now it is beautiful brown again with subtle blond highlights. But it is dry. Very dry. 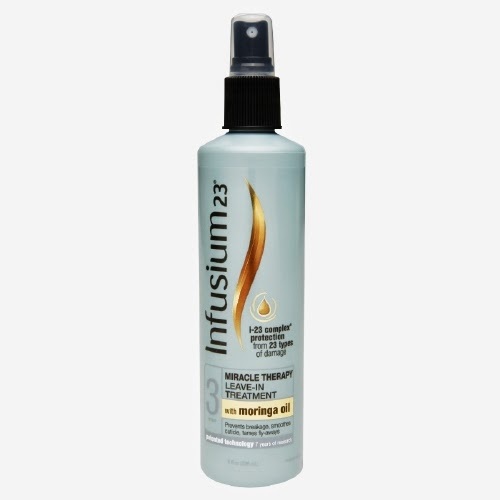 So I thought I'd try the Infusium 23 Miracal Therapy Leave-In Treatment because it used to work great. And while it does make my hair feel softer and less dry on the first day, the second day it feels like I've been rolling around in the desert and rinsing of in the ocean. There is gummy, dirty, heavy feeling to my hair. So, for my hair, the new Infusium is a no go.